While Many Americans danced in the street: when World War II came to an end in 1945, D.W. Onan and his sons. Bud and Bob, celebrated the end of the longest and costliest war in U.S. history with mixed emotions. They, too, were elated over the long-awaited victory by the allied forces. They as much as anyone wanted to see the end to the killing that had been going on throughout the world for so many years, but the Onans knew the months ahead would be extremely tough ones for their company. Long before the actual end of the war, the Onans knew conditions at their company would be changing drastically. They had nearly 2,500 employees working around the clock, all doing the same thing.-.producing generator sets for use by the military. There had been no civilian production since early in 1942. It was obvious that as soon as the war ended, military requirements for Onan products would drop to practically zero overnight. Conversion to manufacturing items for the civilian market again presented many problems for the Onans. They ranged from the very survival of the company to the tragic inevitability of laying off the majority of their workers. The Onans dreaded the prospect of terminating as many as 2,000 of their loyal, hard-working employees as much or more than the thought that losing millions of dollars of orders overnight might destroy the company. The horrendous layoff problem was seriously compounded by the promise that all of the more than 400 Onan workers who had left during the war for military service would get their jobs back. There really was no assurance the total manpower requirements at the Onan company would equal the number of returning servicemen. Fortunately not all of the war veterans would be returning at the same time, giving the Onans time to absorb them. World War II ended officially on Aug. 14, 1945, with the unconditional surrender by Japan. In the weeks following, the Onan company had millions of dollars of cancellations from the military. Terms of the contracts that were cancelled called for the purchase by the government of all materials in process in order to soften any financial hardship. Although the buy-back provision was an attractive proposition, D.W. Onan decided to keep all the materials on hand so the company could convert to civilian production as quickly as possible. It was a wise decision. Materials needed to build engines and generators were still scarce after the war, and because no civilian generator sets were available during the war years, there was a pent up demand for the units. Several major retailers, notably Montgomery Ward and Fairbanks-Morse, plus several smaller companies contacted Onan shortly after the war ended asking for generator sets with their own labels on them. Because Onan had the materials and the units wanted were similar to the military versions, these orders were accepted and the generator sets were delivered. Onan had done considerable business with Montgomery Ward before the war, and in fact, it was these private label orders that helped the Onan company survive the tough depression years. So getting back to producing generator sets for others to sell was not a new or unpleasant experience. The volume of orders in the months following the end of the war wasn’t enough to offset the loss of the demand by the military, but it helped Onan cushion the blow. In anticipation of a growing civilian market, the Onans kept more employees than they needed and more plant space than was required, but it still was necessary to lay off hundreds of workers and to abandon the Madison plant. Onan kept the original Royalston-Highland plant, the University plant and the Arrowhead plant, all of which were now owned by the company. The turmoil at the Onan company in the months following the end of the war is almost unimaginable. Hundreds of workers were laid off each week at the same time returning servicemen were coming back to their old jobs. Most of the employees losing their jobs were prepared for it, but it still was a highly unpleasant experience for both workers and management. Jim Hoiby, the chief engineer in the Onan Engineering Department, recalls the “pink slip Fridays” in late 1945 and 1946. “I was laying off about 20 engineers each week,” he says. Hoiby’s department, which during the war years had about 150 employees, shrank to 35 people by mid-1946. Most other departments had similar experiences. Within a year from the end of the war, total employment dropped from around 2,500 to approximately 500. The payroll remained in that area for several years. There were bright signs in the post-war years, too, as the company designed new products for the civilian market and redeveloped many of the sales programs set up during the 1930s. The heavy export sales that marked the pre-war years were gone, however, along with the wartime military orders. Foreign sales, which accounted for 80 percent of Onan’s total revenues in the late 1930s, suffered primarily from the huge number of generator sets available as war surplus in all countries involved in World War II. A notable exception was South America. There was a relatively heavy volume of orders for Onan products after the war from Brazil, Argentine and Chile, but demand from Great Britain, Europe and the Far East was only a tiny fraction of what it had been in the 1930s. A huge demand in domestic sales more than offset the loss of export trade, especially immediately after the war when the U.S. market had a voracious appetite for hard goods after several years of a starvation diet. In addition to resuming trade with the country’s rural areas, many of which were still without any electric power, there were several new markets for Onan to tap. A post-war homes building boom created a large demand for portable electric plants to be used by contractors putting up the homes. With the war over, people not only had spare time but also money to spend, and the marine business was a big shot in the arm for Onan. Pleasure boats became popular and generator sets were needed for a variety of purposes on the boats, especially the larger models. Other recreational markets also opened and grew. Power for stand-by purposes also figured prominently for Onan after the war. A federal requirement that all new hospital buildings have standby power units boosted sales for Onan, as well as the growing trend by other commercial and industrial buildings to have emergency stand-by generator sets in the event utility power went out. Onan management, realizing the rapidly changing times presented an unusual challenge to come up with new products for different markets, or to stagnate and fail to grow, made a Herculean effort to diversify. The company had been making its own engines to drive the generators, but no effort had been made to get into the engine business itself until late in 1946 when a decision was made to market its highly successful air-cooled engines for purposes other than being on one end of a generator set. The small gasoline engines were offered, and readily accepted. Sales went to original equipment manufacturers to power truck refrigeration units, rotary tillers, pumps, tractors, small delivery vehicles, aircraft energizers, conveyor systems and in many other applications. The decision proved to be a wise move. During 1946 Onan produced a total of 60,000 units, almost all of them generator sets, but in the following year the volume dropped to 41,000 units and 15,000 of those were engines for non-generator use. The falloff in business would have been disastrous if it hadn’t been for engine production. It was in 1947 also that Onan decided to produce a small diesel engine, primarily for continuous running, heavy duty generator set applications. And the Onans correctly felt there would be a big demand for a diesel-powered generator set aboard boats. The safety feature was a major selling point and assured the success of the new product. The Onan diesel engine opened an entire new field that was to play a vital role in the firm’s future. The post-war years meant that once again Onan had to beat the bushes for business, no longer being able to rely on orders flowing in from the government. The company beefed up its advertising and public relations departments, not so much in manpower as in a greatly increased budget. Small ads for Onan products appeared in more than 100 different publications during the mid and late 1940s, along with an ambitious direct mail program. And for the first time, Onan was stressing product publicity, generating articles about the firm’s products for use in the various trade publications. Literature was designed for each of the various products and when inquiries came in, the pertinent information was quickly dispatched to the interested parties. Sales couldn’t keep all of the company’s facilities busy, however, and in 1948 it was decided to close the Arrowhead plant. When a city-financed area rehabilitation program displaced the Royalston plant in 1950, all operations were moved to the University plant. The Arrowhead plant later was reactivated for a short time when military orders spurted again during the Korean War. One of the first major decisions following the war was to change the legal structure of the company. Originally founded as a sole proprietorship by D.W. Onan, the firm became a partnership in 1928 after Bud Onan joined the company. 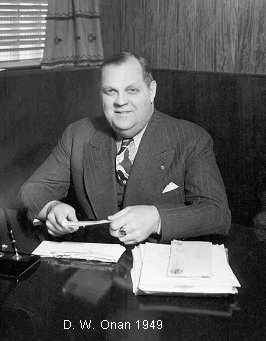 In 1946, the Onans decided there were several advantages to becoming a corporation, and in that year it became D.W. Onan & Sons, Inc. D.W. Onan was elected chairman of the board. Bud Onan became president and Bob Onan was elected vice president and treasurer. Onan was acquired by Studebaker Corporation in October, 1960, following which it was first called the Engine Generator Division of Studebaker, and then the Onan Division. In 1968, the company became the Onan Corporation, A Wholly-Owned Subsidiary of Studebaker-Worthington, Inc. In March of 1972, 20% of Onan’s common stock was offered to the public, and the stock was listed on the American Stock Exchange. In December, 1975, Hawker Siddeley Group Public Limited Company, which also purchased some additional Onan stock, made a tender offer for the publicly held Onan shares, after which Studebaker-Worthington owned 63% of Onan’s stock and Hawker Siddeley owned the remaining 37%. In 1979, Studebaker-Worthington was acquired by McGraw-Edison Company, as a result of which McGraw-Edison owns 63% of Onan with the remaining 37% held by Hawker Siddeley. Although changes at Onan during World War II and in the post-war period were drastic, one thing remained constant during all those years—the treatment of employees as members of the large Onan family, a treatment dictated from the very beginning of the company by D.W. Onan.